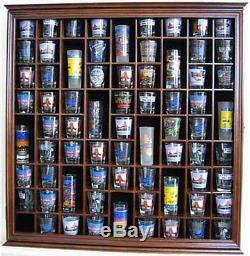 71 Shot Glass Display Case, Solid Wood, Glass Door. Items shown: Natural solid wood in WALNUT FINISH with a glossy protective layer. Fine crafted from hand selected solid wood. Individual compartments for each shot glass. A great way to showcase collections. This cabinet has black felt backing. Brass hinges, door latches, and wall brackets preinstalled for hanging. Repeatedly sanded to created super fine smoothness and elegant appearance. Glass door cover to protect from dust and damage. Dimensions: 26 1/8"H X 26"W X 3 5/8D Weight: 18.5 lbs. Square opening = 2.25" H x 2.25" W. Rectangle opening (larger opening) = 5" H x 2.25" W. If you wish to have other color instead please see my other listings. Our collectible display cases' gives you all the principles of "Value": Great Price, Quality, Durability, and Functionality... Which you will love today and tomorrow. Virgin Islands, APO, or Int'l Countries. The item "71 Shot Glass Display Case Wall Storage Cabinet Shadow Box, SC08-WALN" is in sale since Thursday, November 10, 2016. This item is in the category "Collectibles\Barware\Shot Glasses". The seller is "bestbuydisplays" and is located in Daly City, California. This item can be shipped to United States.